To reserve seats : E-mail bigpinkmusicclub@gmail.com . 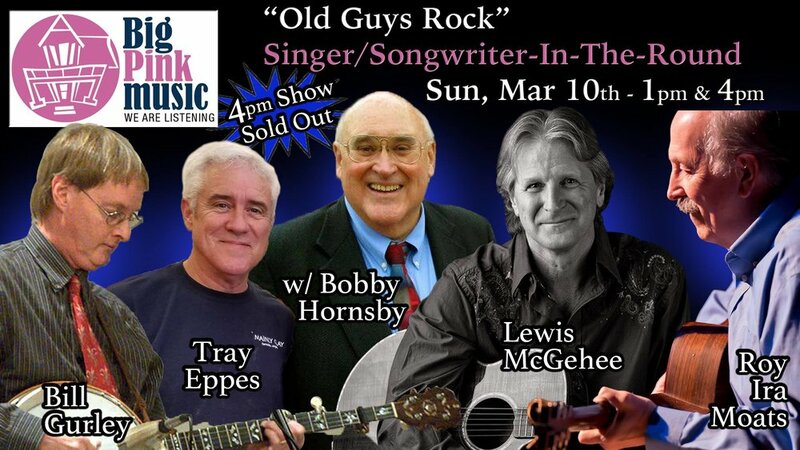 Big Pink Music is proud to present four of the 757's most highly-acclaimed singer/songwriters performing an exclusive acoustic show at Big Pink Music's in-the-round series on Sunday, March 10, 2019, at Hampton’s Victorian Station, the region’s only member-supported listening room. Bill Gurley, Tray Eppes, Lewis McGehee, and Roy Ira Moats, with very special guest bassist Bobby Hornsby, will take center stage -- literally -- for the first signature in-the-round of 2019. The format, made famous by Nashville's Bluebird Cafe and featured on the TV show, "Nashville," puts the artists in a circle ringed by the audience. It's an intimate, shared performance. Victorian Station, the grand building in Phoebus, is the perfect setting. Beer/wine and great new food options will be available for purchase, courtesy of "The Bistro at Victorian Station."